In this episode of Dragon Ball Z, we find the Z Fighters in an epic battle of dice rolling and real estate! Recruit legendary warriors like GOKU, VEGETA and GOHAN to help in this adventure of Monopoly: Dragon Ball Z! Take a chance to be the richest fighter in the world as you encounter the RED RIBBON ARMY and the CAPSULE CORP. Friends like BULMA and MASTER ROSHI can help you along the way on your path to greatness! Can you collect all the deeds and be the greatest? Includes 6 Collectible tokens: Trunk's Sword, DynoCap, 4-Star Dragon Ball, Dragon Radar, Saiyan Armor, Turtle Shell; Custom game board features characters from the series; Houses renamed Kame Houses and Hotels renamed Hyperbolic Time Chambers; Chance and Community Chest cards are renamed Capsule Corp. and Red Ribbon Army; Custom themed Monopoly Money; and Instructions. For 2-6 players. In this episode of Dragon Ball Z, we find the Z Fighters in an epic battle of dice rolling and real estate! 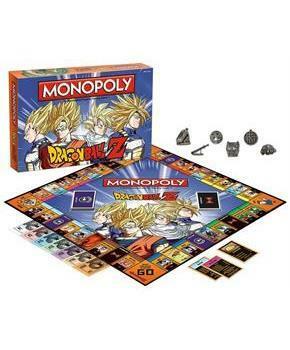 Recruit legendary warriors like GOKU, VEGETA and GOHAN to help in this adventure of MONOPOLY: Dragon Ball Z! Take a chance to be the richest fighter in the world as you encounter the RED RIBBON ARMY and the CAPSULE CORP. Friends like BULMA and MASTER ROSHI can help you along the way on your path to greatness! Can you collect all the deeds and be the greatest? 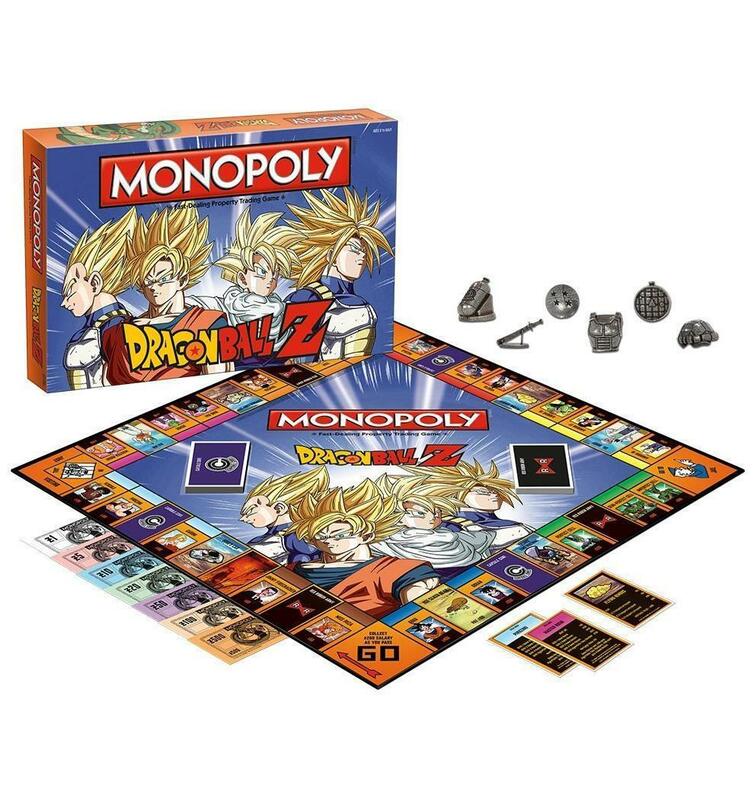 Includes 6 Collectible tokens: Trunk's Sword, DynoCap, 4-Star Dragon Ball, Dragon Radar, Saiyan Armor, Turtle Shell; Custom game board features characters from the series; Houses renamed Kame Houses and Hotels renamed Hyperbolic Time Chambers; Chance and Community Chest cards are renamed Capsule Corp. and Red Ribbon Army; Custom themed Monopoly Money; and Instructions.